We’ve left you without an installment of the Miami Geo Quiz for quite some time — apologies all around and thanks for the patience. Today’s Miami Geo Quiz takes us to a neighborhood within the City of Miami proper. I’ve personally seen peacocks strutting the streets of Miami in at least two City neighborhoods. But in which one was this shot taken? Miami Geo Quiz #9: Look at the photograph below. Identify the name of the neighborhood in which this peacock resides. 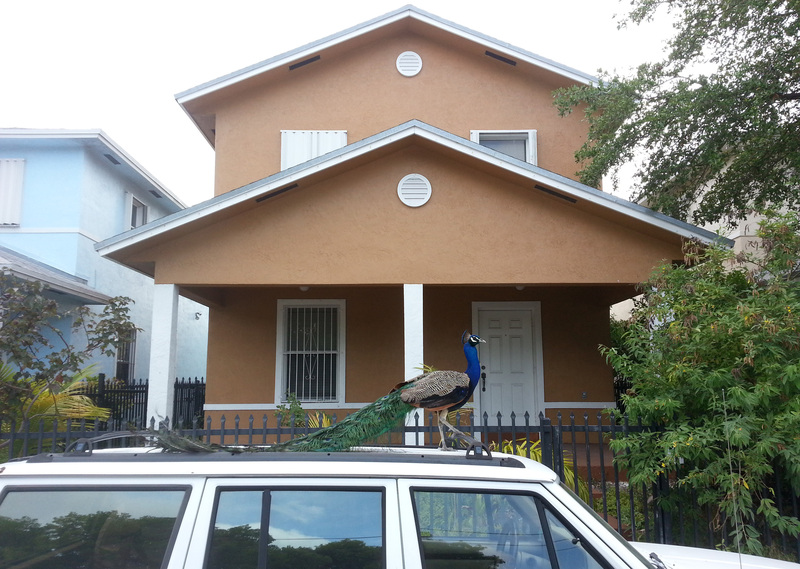 Miami Geo Quiz #9: Neighborhood Peacock. Source: Matthew Toro. May 10, 2014. For extra points, name the north-south street on which this shot was taken. You got it, Jake! Very impressive turn-around time too! It’s Overtown, on NW 1st Place, just south of 20th Street. Miami Geo Quiz #10 will be up soon!